KISS, in 1982, were very much in danger of slipping into musical obscurity in the same way Aerosmith were at the time. Unlike, Aerosmith, it wasn’t drugs that were causing the slide, it was KISS themselves. When I visited their album “Unmasked,” I pointed out that they seemed to be abandoning the hard rock sound that made them a household name, for good or ill, back in the 1970s. “Unmasked” was a deliberate lurch to more commercial sounds that was feared to have started when they released a disco tune on the “Dynasty” album and continued onto the 1981 “Music From the Elder” album, although the latter was an improvement on the predecessor. By 1982, people like me were starting to forget them. My biggest memory of them that year was the night before my battalion was starting its combat readiness evaluation. My company gunnery sergeant told us that when we applied the camouflage make up the next day, that we were not to make ourselves up to look like KISS. What KISS needed was to go back to their heavy roots. One night, at my favourite rock bar on Okinawa, a video came on that made personal history. It was for the song “I Love it Loud” and from first strike of the guitar string, it was clear that KISS had gone back to what made them great. “I Love it Loud” is a complete rock out and since that fateful evening, it has been my all time favourite KISS song. I think the band knew that too because it would be another three years before I would finally get to see them live and they played that song for me. Even to this day, hearing that song makes me want to jump out of my seat. 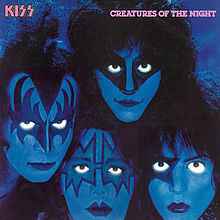 Insert tired cliche here but one song does not make a good album and there are plenty of other great rockers on “Creatures of the Night.” In fact, there it is extremely difficult to pick one that isn’t. Even the power ballad “I Still Love You” rocks and rocks hard. Maybe back then, I should have played that one as opposed to “Beth” in my attempts to woo the ladies. While I can’t fault any track on the album, the ones that really do it most for me, apart from my all time fave, are “Rock and Roll Hell,” the title track,” “Killer,” “Saints and Sinners” and “War Machine” is the perfect closer to this album. It’s also the track for me where Vinnie Vincent comes into his own as a lead guitarist. What I said back then I reiterate now. When I heard “Creatures of the Night,” I concluded that KISS were truly back. Sometime during the recording of “Creatures of the Night,” lead guitarist Ace Frehley would be out and new guitarist Vinnie Vincent would be in. 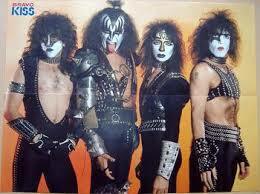 Thus the course of metal history would be changed in the KISS camp. Notice, I said metal here. That is because I believe that this album would be the first KISS album that I would truly call heavy metal. This entry was posted on July 21, 2015 at 8:39 pm and is filed under 1980s, Heavy Metal, Heavy Metal and the 1980s, Music, Rock, Uncategorized with tags Aerosmtih, Classic Rock, Creatures of the Night, Dynasty, hard rock, Heavy Metal, Heavy Rock, KISS, Music From The Elder, The 1970s, The 1980s, Unmasked. You can follow any responses to this entry through the RSS 2.0 feed. You can leave a response, or trackback from your own site. I AGREE. This is the first Kiss METAL album. Love Gun was about their heavier before this but I don’t think it’s really heavy metal. I’m with you 100% on this one. 5/5 stars from me. 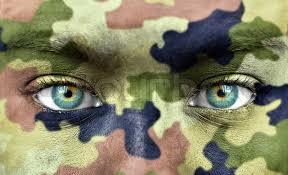 You in Kiss camo would have been awesome. Thanks, maybe I should have tried it. Love Gun was heavy but I agree, it’s not metal. At least not like Creatures of the Night. Haha Kiss camo! Sounds like your sergeant had some experience with it. I didn’t realize that Kiss had changed their sound (or lineup, for that matter — thanks, Mike!). I came across some 70s performances and they’re Fantastic capital F. I expect this album is worth the listen. Hey Danica! I have to say — one of the things that appealed to me about Kiss as a young kid was that they had different periods with different sounds and members. And almost all of them sing lead…the current Kiss lineup has four lead singers as did the original! A total of 8 different members have sung lead on various Kiss songs. That explains things, Mike! In a 70s clip I thought the lead singer was great…and wondered who it was. He was different but familiar. They’re just a fireball of talent, aren’t they? I think most of the members of Kiss are underrated. I saw Phantom of the Opera in Toronto in 1999, and Paul Stanley played the Phantom. It doesn’t get much more prestigious than that for a singer. I wonder how the underrated thing happened. Maybe the element of theatre is distracting for some. The music itself is also a lot of fun and that can prevent listening a little more carefully. Phantom of the Opera! That’s impressive but not at all surprising. His voice is wonderful. I’d love to see that. That was what KISS used to use as their selling point. They claimed that they were four members all doing an equal share for the band. When I saw them, the only member not to sing lead in any song was Bruce Kullick. You’re quite welcome Danica. The 70s were considered KISS’s hey day and they were certainly fantastic live. Even when I saw them in 1985. This album is definitely worth a listen. I shall look forward to it :). One of the best albums ever! Great review. Thanks, I think it’s one of their best too.